1966 was a turbulent year in American history and an active time on The Sunset Strip. The youth counterculture movement was protesting the war in Vietnam, fighting for civil rights and influencing U.S. politics, fashion and music. 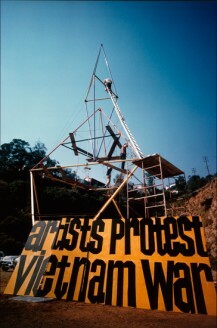 As a direct result of the opposition to the Vietnam war, a group of artists in Los Angeles worked with sculptor Mark di Suvero to create "The Artists’ Tower of Protest" as a symbol of their collective dissent. Originally built on an empty lot at the corner of Sunset Boulevard and La Cienega (now where Pink Dot is located), the tower was surrounded by hunderds of panels designed by artists from around the world. Messages of love, peace and political dissent were created and placed on public display. This year as part of the Getty’s Pacific Standard Time project and festival, a reimagined version of the tower will once again be built and displayed on The Sunset Strip as a way to "reflect on this important historical moment in Los Angeles history" as well as to examine the role of arts activism today. The new tower will be located on the "west" end of The Strip, near The Roxy Theatre and 9000 Building. LA><ART invites artists to join in the construction of the Artists’ Tower of Protest by making a panel to express your individual dissent. The panels must be 2′ x 2′, maximum thickness 3/4″, waterproof. Grommet holes must be made in each corner in order to facilitate their installation. LA><ART asks that you please email peacetower2012@gmail.com to confirm your participation in advance. All panels must be received at LA><ART by January 13, 2012 at 6 p.m. Please note that participation is on a first-come, first-served basis. For more information, please review the call for artists. The "Tower of Protest" is organized by LA><ART and the Getty Research Institute for the Pacific Standard Time Performance and Public Art Festival and is curated by Cesar Garcia, LA><ART Senior Curator. Image: "The Artists’ Tower of Protest," 1966, designed by Mark di Suvero. The Getty Research Institute, 2005.M.11. Photo by Charles Brittin.